Congratulations to Kyzer the Husky - our 2017 Halloween Dog Contest Photo Winner! The Puppy Mama Halloween Dog Costume Competition Winner is KYZER the HUSKY! From lions to super hero costumes, our pups around the world went above and beyond to compete in our first annual Puppy Mama Awards Best Halloween Dog Costume Competition. We had an overwhelming list of creative photos submitted - thank you to everyone for paw-ticipating! Out of the 53 contestants that were selected and featured on the Puppy Mama Instagram page, Kyzer the husky had the most votes... making him this year's winner! 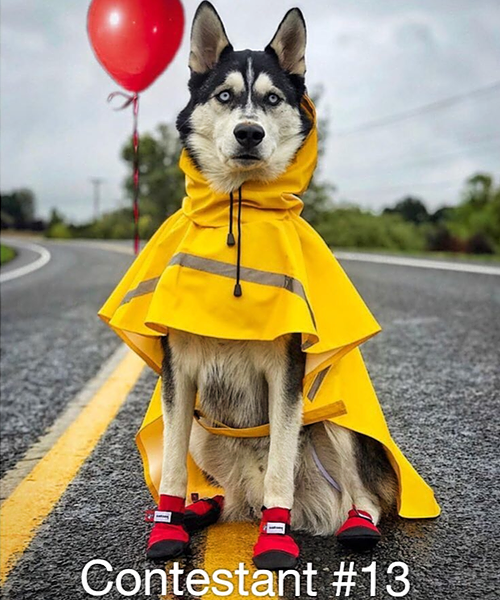 Not only is Kyzer quite the dog model, but he also strongly featured Stephen King's IT in his Halloween costume - making him quite the hit amongst our puppy mama fans! Congratulations to Kyzer - WOOF, WOOF! Follow Kyzer on Instagram and on his blog, Kyzer the Husky. The Puppy Mama Style is here! Stylish dog mom apparel, dog products, dog beds, dog accessories, and more!